BP's announcement yesterday that it is pulling out of the Utica Shale should not come as a surprise when looking at their acreage position (Trumbull County) and reported Q4 2013 production results. BP took a chance testing this area. Such risk is necessary to better define the extent of the play. Others seeking acreage in Trumbull County should thank BP for getting some results in on such areas to the north. 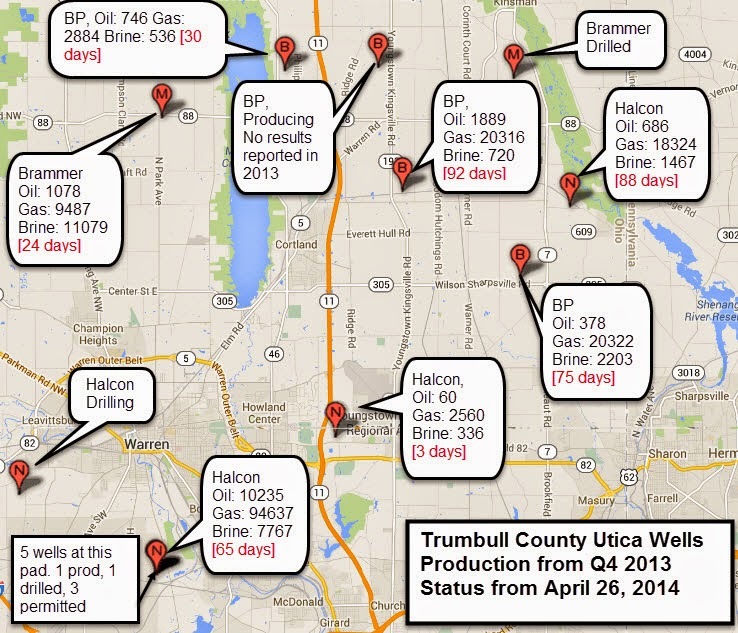 Trumbull County wells: Production number for Q4 2013. Status updates as of April 26 ODNR report. Trumbull County, at least in Hartford, Johnston, and Mecca townships do not look to be prolific enough to merit further investment, at least for now using current methods. The BP Trumbull County production results must have been a significant disappointment, though oil and gas companies are accustomed to a level of risk when exploring untested acreage. This also points to the fact that we are working with an inexact science. BP must of had some indication that the tens of millions spent had some chance of success. We don't know exactly what is down there, despite the best geoscientists studying the area. Production results are the yard stick, though even then, the methods used for locating the well path and fracking and completing the well can all have a huge impact on production. The map below, showing the BP wells (labeled "B"), detail the locations, results, and other operators in the area. Things look better further south. Halcon's 5-well pad to the southwe looks to be going ahead. Brammer and Halcon are the only other operators in the county at the moment. The first of Halcon's wells in the southwest portion of the county looks to be the best performer of the bunch and the fact that Halcon followed this up with a 5-well pad and another well drilled must be a positive sign.